A Vietnam visa is a legal certificate granted to a foreigner or overseas Vietnamese to indicate that the applicant’s credentials have been verified and he or she has been permitted to enter the country for a temporary stay within a specified period. 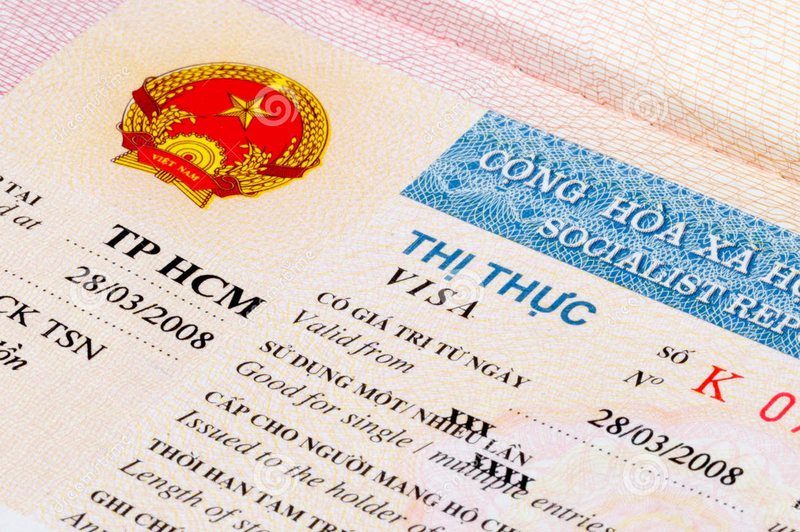 Permission can be performed by an approval letter issued by Vietnam Immigration Department – Ministry of Public Security but commonly a stamp endorsed in the applicant’s passport certified by Vietnam Immigration Department – Ministry of Public Security, Police Immigration Management of a City/ Province under Central authority, International Security Department in all international ports of Vietnam. 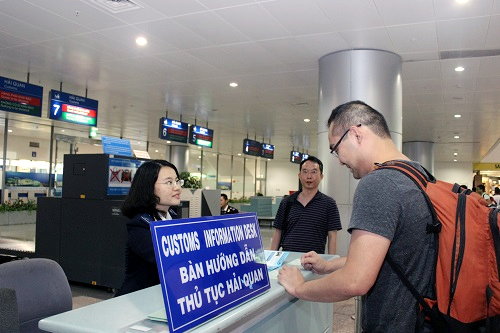 Citizens from some countries signing unilateral or bilateral visa exemption with Vietnam are allowed to enter and stay in Vietnam for a period time stipulated till the expiry date of Agreements. Vietnam Visa can be issued directly in Vietnam, international port of entry or overseas Vietnam Embassies. Vietnam visa for Tourist (Visa symbol: DL) is the entry Vietnam visa for TRAVEL or VACATION purpose, which is valid until 90 days with single entry or multiple entries. 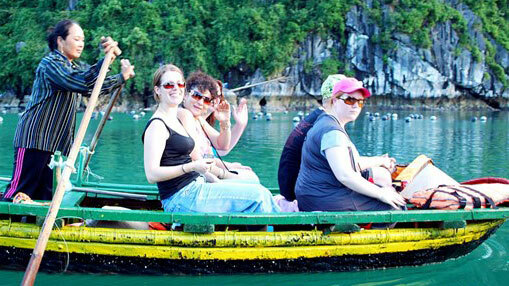 Especially, from August 25, 2016, only American passengers can get 1-year Vietnam tourist visa. However, they are required to exit Vietnam every 3 months. Vietnam Business Visa is granted to a foreigner or Oversea Vietnamese who travel to Vietnam for business purpose in short time. It offers the validity not longer than 3 months with single or multiple entries. Vietnam Business Visa is symbolized as DN if applicant comes to work with companies in Vietnam and NN3 if applicant comes to work with foreign non-governmental organizations, representative offices, branches of foreign traders, representative offices of other foreign economic, cultural, professional organizations in Vietnam. Vietnam Working Visa (Visa symbol: LĐ) is granted for a foreigner or overseas Vietnamese who come Vietnam to work for a long time and have Vietnam Work Permit or Work Permit Exemption Certificate. The validity of LĐ visa is not exceed 12 months with single or multiple entries. 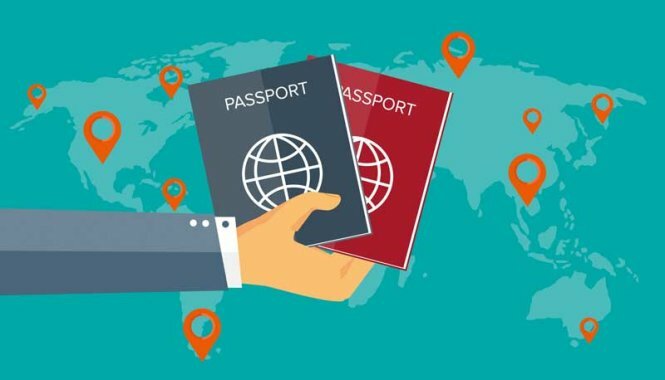 Foreign labors can get LĐ visa at overseas Vietnam Embassies, Vietnam international port of entries or upgrade their short-term business visa to LĐ visa if they have Vietnam Work Permit or Work Permit Exemption Certificate while they work in Vietnam. It is granted to a foreigner or overseas Vietnamese who come to work for a long time in Vietnam and have Vietnam Work Permit or Work Permit Exemption Certificate which is valid for more than 12 months. The validity of Temporary Residence Card is 2 year in maximum and follows the duration of Vietnam Work Permit or Work Permit Exemption Certificate. It is issued when foreign labor is working in Vietnam. Vietnam Investor Visa is issued to a foreign investor (Owner, investor, shareholder of Joint Stock Company or Company Limited) who is appeared on Investment License or Business Registration License as the investor in Vietnam and foreign lawyers practicing in Vietnam as well. Investors in Vietnam are not required to get Vietnam Work Permit. The duration of ĐT visa is not longer than 12 months from the first date of entry with single or multiple entries. Foreign investors can get ĐT visa at international port of entry or overseas Vietnam Embassies. Vietnam Temporary Residence Card for foreign investors is symbolized as ĐT. Vietnam Temporary Residence Card for foreign investors is issued to a foreign investor (Owner, investor, shareholder of Joint Stock Company or Company Limited) who is appeared on Investment License or Business Registration License as the investor in Vietnam. Investors in Vietnam are not required to get Vietnam Work Permit. The duration of ĐT visa is valid for 1 year at least and up to 5 years in maximum with single or multiple entries. Foreign investors can get this type of temporary residence card when they are working and staying in Vietnam. 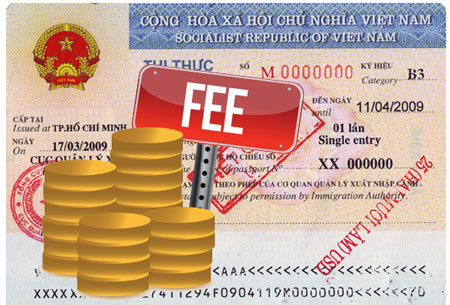 TT Visa is issued to foreigners that are parents, spouse, children under 18 years of age of a foreign labor, an investor or to a foreigner who is father/mother, spouse or child of a Vietnamese citizen. The validity of TT visa is not longer than 12 months with single or multiple entries. You can get TT visa at international port of entry or overseas Vietnam Embassies. TT Temporary Residence Card is issued to foreigners that are parents, spouse, children under 18 years of age of a foreign labor, an investor or to a foreigner who is father/mother, spouse or child of a Vietnamese citizen. The validity of this type of Temporary Residence Card is valid for 1 year at least and up to 2 years for foreign labors’relatives or up to 5 years for investors’ relatives and it follows the duration of Temporary Residence Card of foreign labors or investors with single or multiple entries. You can get TT Temporary Residence Card while you are staying in Vietnam. Vietnam visa exemption means that nationals of certain countries and regions which have Visa Waiver agreements with Vietnam, may visit Vietnam for a period of time. 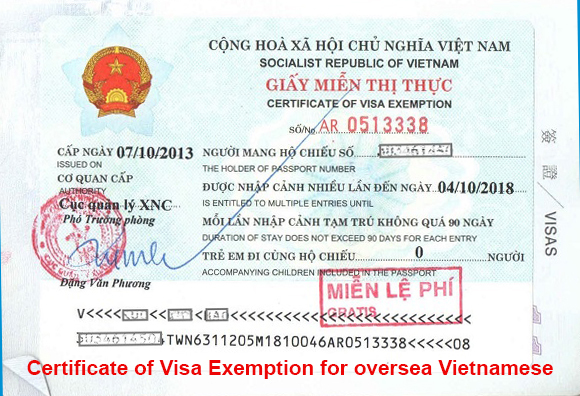 Vietnam visa exemption is applied to unilateral or bilateral Visa Waiver agreements, and 5-year visa exemption for Vietnamese people residing overseas who have passports or laissez-passers issued by foreign authorities, foreigners being their spouses or children; foreigners being spouses and children of Vietnamese citizens. 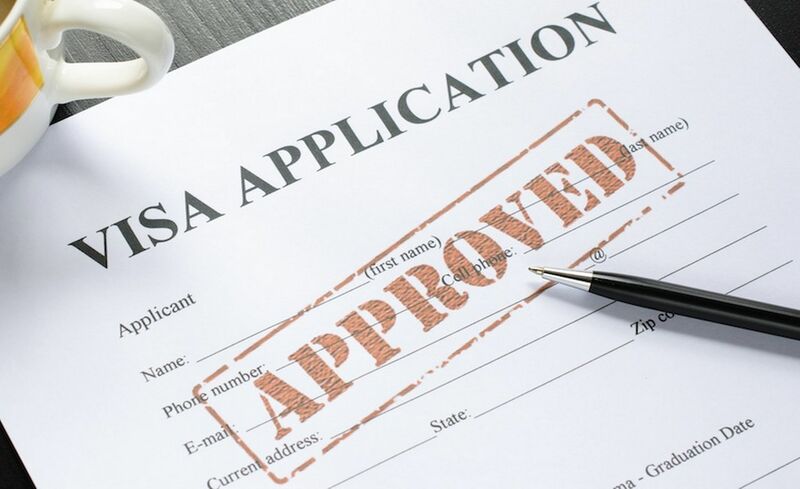 Bilateral Agreement on Visa Exemption between two countries expresses that citizens of two countries can enter each other country without visa for a stipulated period of time. For instance, Vietnam has signed bilateral visa exemption agreement with Singapore, so that Vietnamese citizens can enter and stay in Singapore for 30 days without visa and vice versa. At present, Vietnam signs bilateral visa exemption agreement with 9 ASEAN member countries for stay of 30 days (except 14 days for Brunei & Myanmar and 21 days for the Philippines). From August 11th, 2017, citizens from Chile are allowed to enter and stay in Vietnam for 90 days in maximum without visa. Unilateral visa exemption means that only one country between two countries on agreement about visa exemption agrees to waive visa. For instance, unilateral visa exemption agreement between Vietnam and Japan, Vietnam allows Japanese citizens to enter and stay in Vietnam for 15 days without visa but Vietnamese citizens must apply for Japanese visa prior to traveling to Japan. Vietnam now unilaterally grants 15-day visa-free entry for citizens of 13 countries, including: Germany, France, United Kingdom, Italy, Spain, Belarus, Japan, South Korea, Norway, Finland, Denmark, Sweden, Russia. 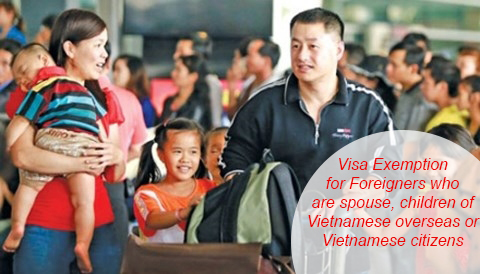 5-year visa exemption certificate is applied to Vietnamese people residing overseas who have passports or laissez-passers issued by foreign authorities, foreigners being their spouses or children; foreigners being spouses and children of Vietnamese citizens. The duration of each stay for 5-year visa exemption certificate holder is up to 180 days in maximum. After 06 months for first entry, you can extend the stay up to 06 more months at Immigration Office/ Department. 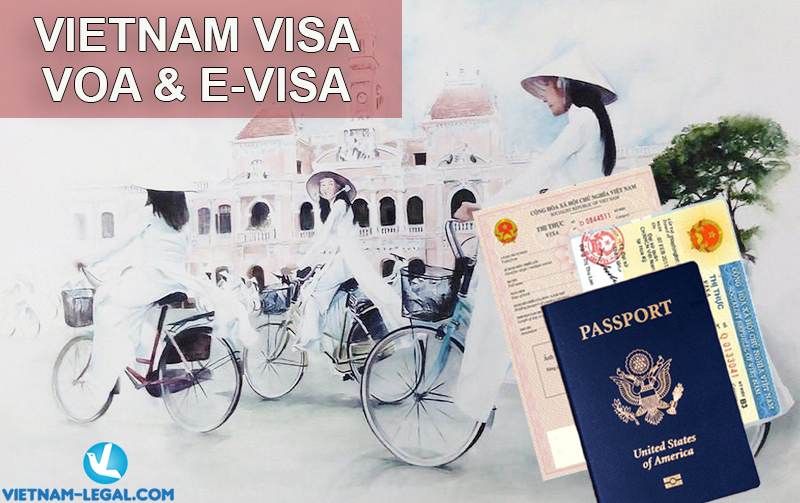 – Foreigners entering Vietnam under visa exemption cannot change or upgrade to different type of visa with different purpose. You need to exit Vietnam and come back under new visa which is matched with your purpose (working, investing, studying). – The next entry date for foreigners entering Vietnam under visa exemption must be at least 30 days from the previous exit. All information of Vietnam immigration shall be found out at Vietnam-legal.com in the most adequate, exact and fastest way. Your satisfaction is our expectation and concern. 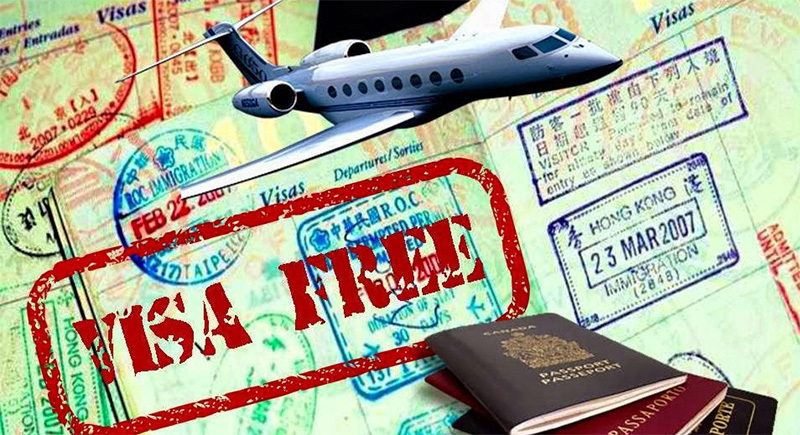 What are pros and cons of Visa on Arrival, E-Visa, and Visa at Embassy?